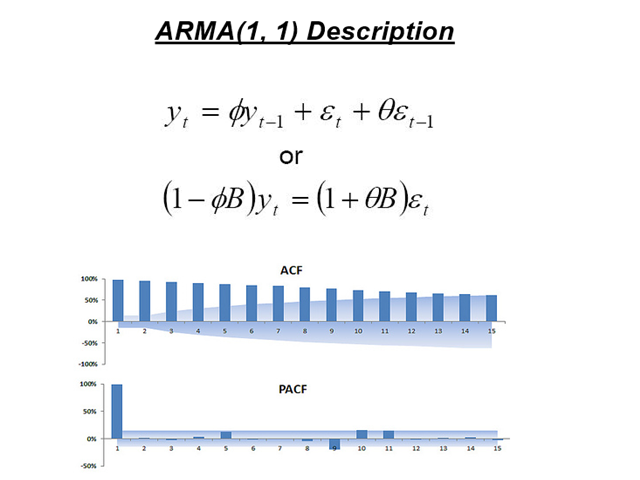 GARCH is the short initial for Generalized Autoregressive Conditional Heteroskedasticity and it is the volatility prediction model commonly used in financial industry. 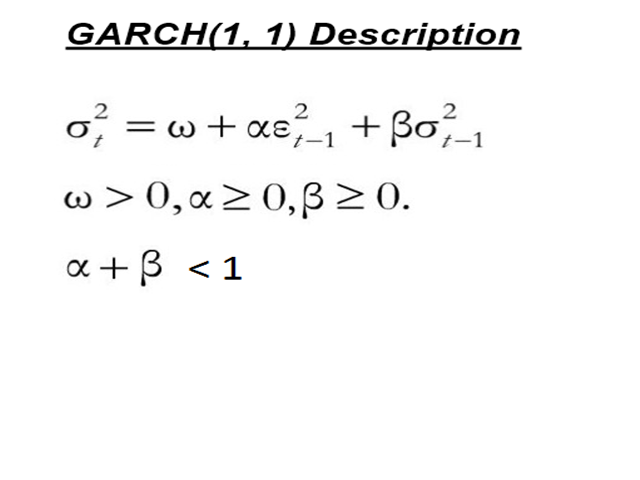 GARCH model was first appeared in the work by Danish Economist, Tim Peter Bollerslev in 1986. The 2003 Nobel Prize winner, Robert F Engle also added much contribution for the refinement of GARCH model with Tim’s work. 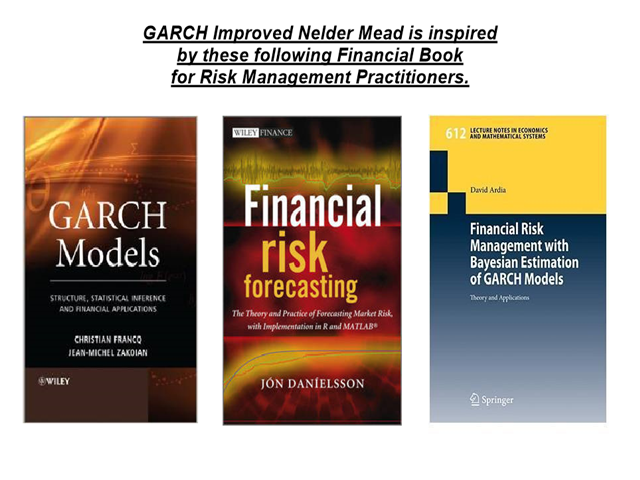 Our GARCH INM predictor took the original method of Nelder Mead for GARCH model building. 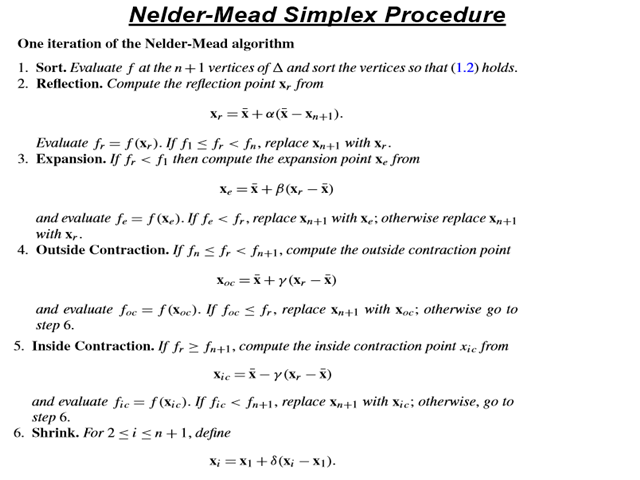 However, the original Nelder Mead’s method occasionally misses convergence and therefore, we improved the original Nelder Mead method by incorporating intermediate ARMA (Autoregressive Moving Average) step before GARCH step. 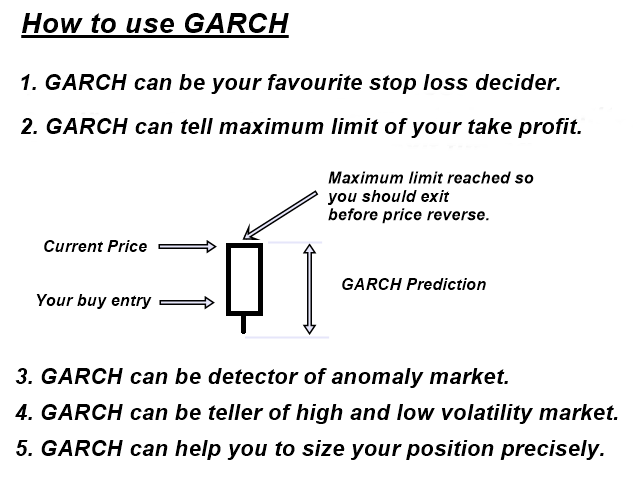 The whole purpose of GARCH INM predictor is to improve trading performance. Here are few tips. Our GARCH INM predictor uses point as basic unit. Therefore, the predicted volatility can provide trader scalable idea on future volatility. For example, if GARCH predicted 1120 point (112 pips) for current candle with 95% confidence interval, then you might expect that there is 95% of chance for current market to stay within the 112 pips range. Detecting anomaly market is also another important function with GARCH. 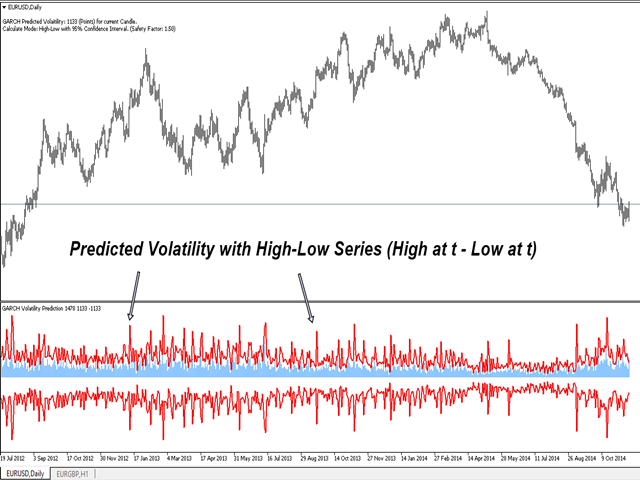 If price range for current market moved outside the predicted volatility (95% confidence interval), then this is the anomaly event with 5% Probability to occur. Volatility has very close connection to trend. Increasing volatility often tell you start of trend. 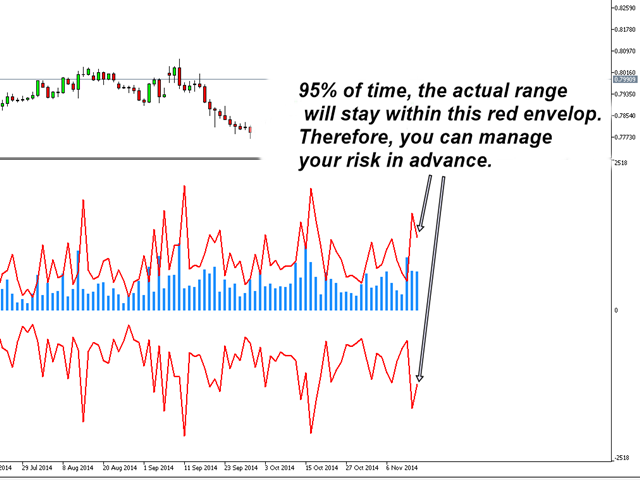 Filtering out range market using our GARCH INM predictor, you can aim to enter trend market. NumberOfObs: Number of observations (data point) to be used for calculation. We recommend minimum 1000 data point. UseHighLow: With use of High-Low mode (true), the range is calculated using high – low. 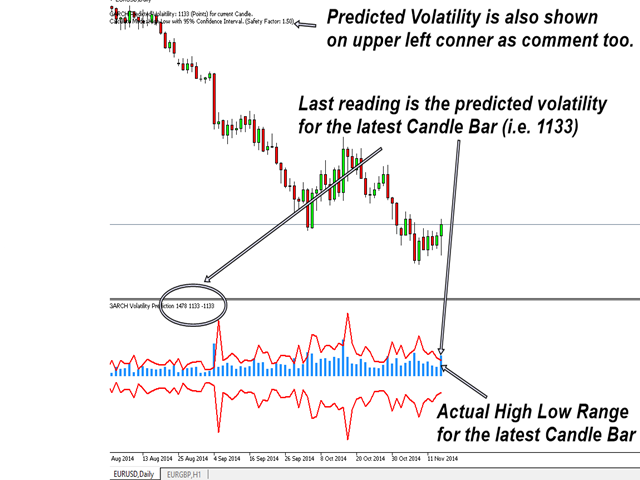 If UseHighLow = false, then close – previous close will be used to calculate range. We recommend using default for your trading. ConfidenceInterval: Confidence Interval for GARCH prediction. We provide 90%, 95% and 99% confidence interval. This confidence interval provides you probabilistic sense for future market range. SafetyFactor: Safety Factor is added for extra safety of trading operation. Safety Factor should be greater than 1. 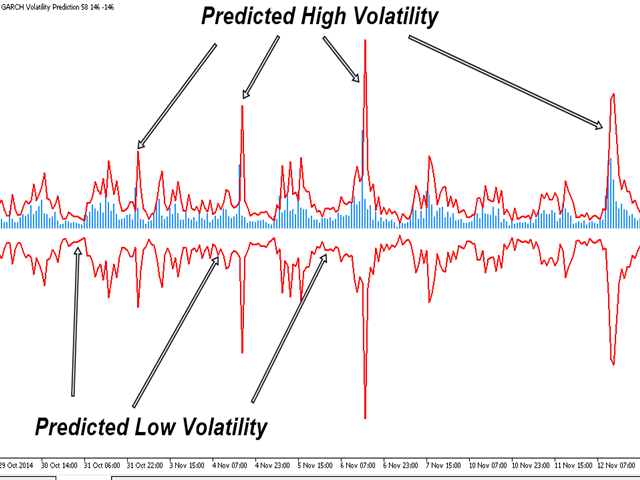 If Safety Factor = 1, then the predicted volatility is equal to original GARCH volatility. 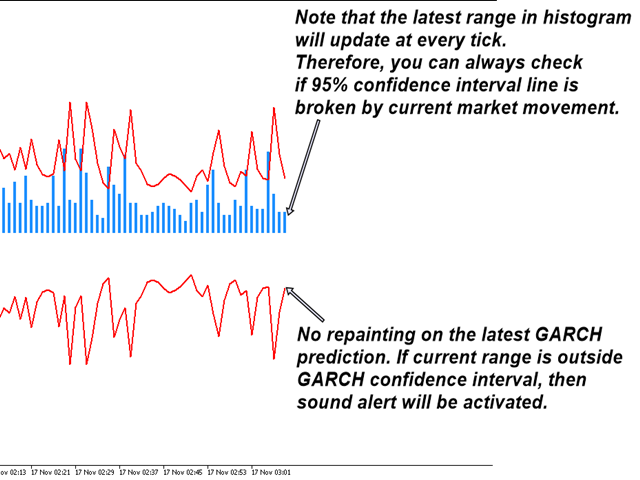 If Safety Factor = 1.5, then the predicted volatility will have 50% safe margin over the original GARCH volatility. This GARCH indictor is an attemp to bring advanced scientific method in real world trading application. Parameter estimation of GARCH algorithm is notably difficult and misleading even among experienced statisticians. 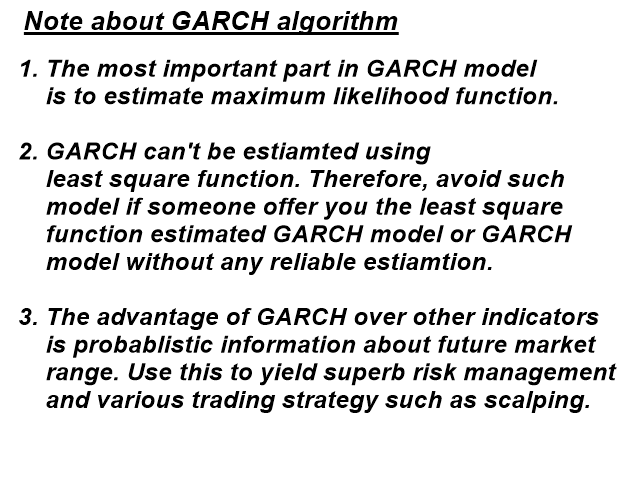 Here we give the self optimizing GARCH algorithm for enthusiastic Scientific minded traders. This is free software and therefore, we may offer you limited customer service on our GARCH Nelder Mead. Rather than that, please enjoy this free but powerful trading system. 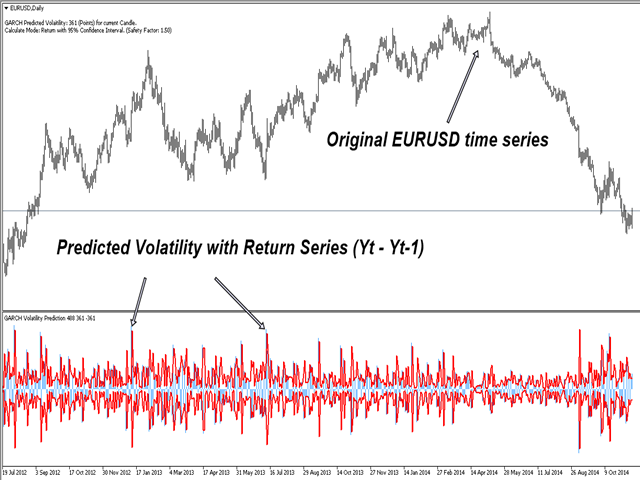 If GARCH parameter is within acceptable accuracy to its true parameters, then you can have really powerful volatility predition tool for your strategy. Author, Finance Engineer has a decades of experience in building trading and investment system using advanced mathematic and scientific methods. This theory is disproven. Seeing many candles on higher time frames within the 95% confidence interval not staying within the range on the next candle. Should be confidence intervals for over more candles. This indicator needs to be rewritten.